Kneel before Non just doesn't have that ring. Kal-El is more human on his nurture-side? I don't think so, but at least they dealt with the issue of "where is Superman". And, yeah, they're straight up taking the piss out of the Murderverse. "We'll make that S into a symbol of hope". Alex's kryptonite-laced suit seemed familiar. Oh, poor red-headed office drone, we did not know ye. Would it have killed them to thread her through some scenes earlier in the series. Kelly? Was she Kelly? Kal-El is more human on his nurture-side? I don't think so, but at least they dealt with the issue of "where is Superman"
Yeah that part didn't thrill me, just because I don't think it makes much sense. Not amazingly nonsensical for comics, but in the bottom half. I'm really really nervous that they're going to kill Alex off. It would be a dumb move for the show, I think, but getting all "I'll tell you when I get back" is a surefire way to get yourself killed. "If Alex dies, we riot". Storywise, Wynne could die, and Cat probably should die (although, after this episode, I think they have genuinely built a nice relationship), but they do seem to be setting Lucy up as Replacement Danvers. Ugh no don't say that. Lucy is such a downgrade and I cannot take J'onn J'onzz feeling like he failed their father. I will lose my mind. So Cat has to know (again) by now right? I cannot take J'onn J'onzz feeling like he failed their father. I will lose my mind. If this happens I might disallow watching of this show while I am in the room. I just would not be able to take it. I love his fatherly connection with Alex and Cara and I really don't want Alex to die because I love her relationships with Cara and Hank and they would both be sad and maudlin and depressing if she died and I would be SO UPSET. It would both destroy several good relationships and send some good characters on a really boring self-loathing emotional arc that I don't think anyone would enjoy. I would be so angry and sad if the show did that. I don't know if there's anything about this episode I liked. A certain amount of the broadcast network spoonfed cliches is something I've decided to accept as part of this show's earnest charms, but I felt that this episode was full-on, relentless mediocrity. "If this happens I might disallow watching of this show while I am in the room. I just would not be able to take it." I have trouble believing that the show killing Alex is even remotely likely -- the sibling relationship is the core relationship of the show. I can imagine the goals that they might think would be served by getting Alex out of the way, but that only makes sense if they didn't realize that Alex and Kara's bond is the heart of the show and its lack would cripple it. More likely the foreshadowing of the "tell you when I get back" indicates that they won't kill Alex, but that she'll be badly injured, maybe in a coma or something, and will be out for the last two episodes of the season. I don't know. Placing Alex and Hank off-stage and putting Lucy front-and-center in their place does seem ominous. Like, maybe, the sort of thing they wouldn't do if they had a choice but is forced on them by budgeting or contract negotiations. That's a scary idea. "So Cat has to know (again) by now right?" They're playing this close to the vest. Is there a name for that over-the-shoulder-while-hugging shot that includes a significant (unseen by anyone) expression on a character's face? They did that and I wondered what it signified. Just her thinking about her bond with Supergirl? That she knows that Kara is Supergirl? What? I don't know. The thing about recognizing Barry as the Flash seemed to be lampshading. Really, though, I think they're just toying with the audience and they haven't decided whether they want Cat to know and so they're just giving us obvious-but-ambiguous clues that don't actually tell us anything. Also, apparently the writers imagined Cat and Supergirl standing at a window when Cat says "I love the view from this window", but they staged the scene on the balcony and nobody noticed or cared. These are the people who wrote a character in a grave with no idea what character it was, so I wouldn't be at all surprised for them to have no idea what Grant knows or doesn't. Can anyone articulate why Non just isn't very engaging? You just can't trust a Brainiac. And this Maxwell Lord fellow is actually managing to make me feel sympathetic towards a Kryptonian. "We're not that different, you and I." Really? That's the speech you're going with? Hmmm. Per the usual, I found this a mixed bag. * I have often said all I wanted out of Supergirl, re: Superman, was five minutes about why he couldn't help. They offered, and I am sincerely content. It was a dumb reason, but I'm okay with that. * Maxwell Lord's failures this episode were, on the other hand, pretty galling. He figured out the evil Kryptonian plan. He worked out a tech shield. He then... failed to disclose his concerns to the US government. He failed to take the satellite offline. He had the ability to make personal anti-Myriad shielding, and only made one for him and one for Cat, instead of working on getting his security team covered or something. * Alex's stupid, stupid insistence to go back to National City was painfully stupid. Like, "You can protect me, J'onn! It'll be fine!" That painted her as wholly incompetent at her job and at life, and was the thing that most strained my willing suspension of disbelief. There's just no way someone capable of that made it this far in the DEO or maintaining Supergirl's cover. It's insane. * I'm with Ivan about Cat and Supergirl - the writers themselves are undecided, and playing coy. It's annoying. Cat should be on Team Supergirl, and this episode demonstrated it more effectively than most. She's smart. She's inspiring. She has excellent resources and contacts. She's brave. She is simply a better choice than Jimmy or Winn, neither of whom could have plausibly filled her shoes in this story. 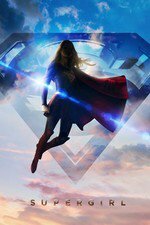 * I agree with the AV Club that one thing Supergirl continues to get right - and pulls me into continued viewing with - is that it's nice that Supergirl continues to strive to be a hero. It's a little corny, but in this world of Zach Snyders and Civil Wars, I'm counting that as a serious plus. I liked that she took a third option even if the episode was pretty dumb. So, a good villain needs to make you *want* to see them. That can take a lot of forms: some villains are sympathetic, where you get why they're doing what they're doing and you can sorta root for them, or at least see them as a person - for instance, I feel for the guys in the Suicide Squad, which is why I'm so dubious about the movie. Sometimes the villain is just cool - see anyone played or voiced by James Earl Jones, or in the CW DC universe, any flavor of Harrison Wells. Non doesn't have any of that. His solution to global warming is to turn everyone into mindless drones, which is... just hard to swallow as sincere. Like, it runs into 'not even wrong' territory. Indigo's reaction to Myriad is a lot more sensible, from a 'write a villain' sense - at least she wants to use it for something that logically follows. He has no screen presence - he's not physically intimidating, he doesn't get cool lines. So... we don't - and cannot - sympathize with his motivations because they don't make sense, and we don't expect to see or hear him do anything interesting in any specific moment. I hope that covers it? I'm sure someone else can expound further, or I can try again later, but he fails on pretty much every level. Like, it's not so much that they did something wrong as that they did nothing right. He has no screen presence - he's not physically intimidating, he doesn't get cool lines. This is it for me. It's like watching Supergirl fight a human being made of unsweetened apple sauce. It's there, but does anyone know why or care? He doesn't seem to. Astra was a much better villain. He looks too much like Sting for me to take him seriously as a villain. I really don't like the Alex and J'onn on the run storyline, because frankly the Alex/Kara/J'onn/DEO dynamic is the heart of the show. But I was more engaged than I often am this week, just due to the absence of a time-sucking CatCo b-story. Every time they actually involve Cat in the superhero story, she and it both become a few times more interesting. That held true here. See where I'm going with this? Fix the DEO stuff, let Cat in on the Supergirl secret, relegate the day job stuff to about three minutes an episode, and...well, and you'd have a show that looked a lot more like The Flash, admittedly, but is that really such a bad thing? I'm pretty sure Cat was back on the "Kiera"=Supergirl train as soon as J'onn used his shape-shifting and flight powers in the middle of the city for everyone to see. And is it just me, or does the way Non described Myriad remind anyone else of the Anti-Life Equation? So, what you guys are saying is that Non is a bit of a non-entity? Is it okay with y'all if instead of Indigo, I just call her Brainiac Smurf? Also, are we sure Peter Facinelli's hair isn't a wig? Something weird is going on at his neckline. I am bored to near-literal tears by Non. Whether that's because my idea of Non is always going to be this dude or because of some actual reason, I'm not entirely sure... but I find it telling that Supergirl's version of Non is less engaging than the version of Non that actually did not speak. Seriously, though, I think perhaps it's the lack of investment. At least Astra was Kara's aunt -- by blood. And was her mother's twin. And was evil as compared to Kara's initial impression of Alura's "goodness". Compared to the complexities of Astra's relationship with Kara, I would think that Kara's thinking when it comes to Non is basically "you're my uncle through marriage and you're trying to take over the world... nope." As oh yeah! said, "Kneel before Non" just doesn't do it for me. Zod 4EVA. Also, if they're just screwing with us and Cat actually knows and is just playing dumb... ***sigh*** Can she just know already?? As oh yeah! said, "Kneel before Non" just doesn't do it for me. Superman dropping like a stone because of his human upbringing since birth = LOL. Alex insisting on coming along was suuuuch an idiot ball move. Calista just Celebrity Paradoxed this show, damn. I loved Alex's mom wanting to ask "Hank" all of those scientific questions. I'm kinda hoping Kara and Cat settle into a "We both know, but we're going to pretend otherwise so we can keep the status quo mostly the same," groove. They might be there already, come to think of it, but I don't think Kara's usually that subtle. Did it seem to anyone else that maybe that's not all she wanted?